Book Bloggers International: Featured #Bookstagrammer Emma, aka @wordsandpeace! Featured #Bookstagrammer Emma, aka @wordsandpeace! Alors, book bloggers, please welcome Emma! When she's not blogging at Words and Peace, running France Book Tours, or writing, she's snapping bookish photos on Instagram as @wordsandpeace1. Bonjour, Emma! I'm French living in the US. I work all from home: giving French online classes through skype, translating English novels into French, running a virtual book tour company (France Book Tours), and painting on rocks! I read all kinds of genres, but enjoy especially historical novels and books in translation. Apart from devouring books and painting, I love hiking and birding. 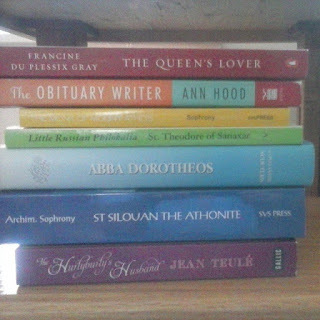 My next great ambition: publish a 2nd book, this time based on books I have reviewed, and also re-translating in French some old English book. Some translations are really dated. I started about 6 months ago. I was seeing tons of book bloggers I follow using it, but at the time I didn't have a smart phone. Then I realized my cheap carrier, Tracfone, has also smartphones! This was the first app I installed on my phone I think! quick and easy way to share when I start or just finished a great book. plus it's visual, no need of long blabla, a book cover says it all! how many book bloggers do post about their pets! they say I'm a book addict. that's 500% true! Be sure to follow Emma on Instagram and check her out on her out on Twitter and Facebook. Emma would also love suggestions and advice on how to use Instagram better! If you have any tips that have worked for you, share em in the comments.